We got the new design space at the new shop all framed and clad. Tomorrow, my very good friend Joe from the sign shop Christoff Creations, is coming in with me to work on getting the space textured so we can keep moving forward. 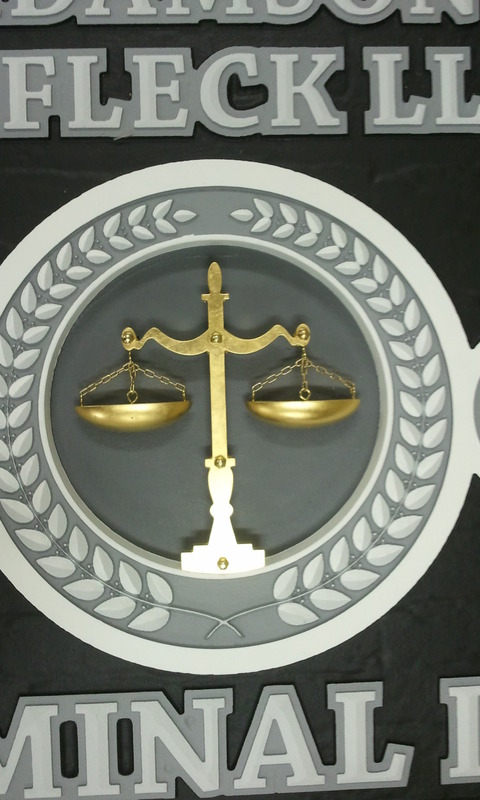 In the mean time, I worked all day on getting the Lawyer sign close to completion. There was a little bit of painting and gold leaf left to do. 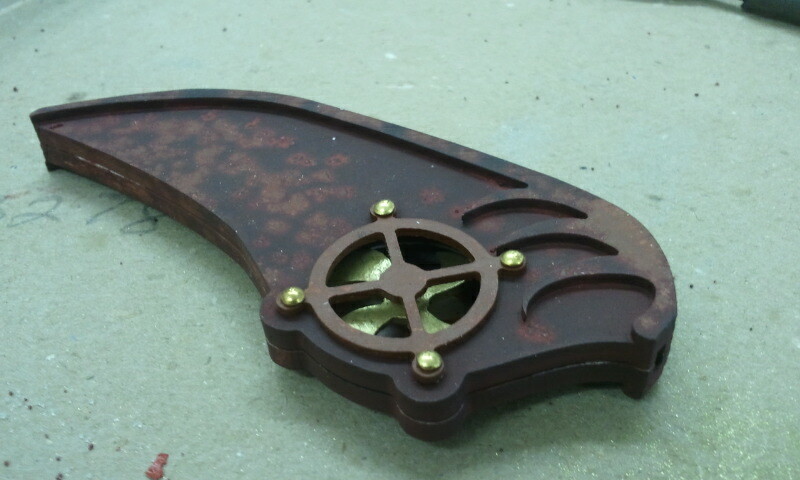 I had cut the parts for the scales of justice on the weekend, so they would be ready for today. 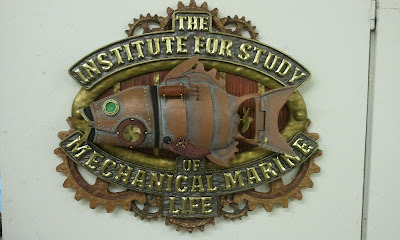 I used brass fasteners with lots of Locktite to mount the scales and bowls to the sign backer. The fasteners go right though to recesses in the back of the sign. I will fill the back tomorrow at some point. I also received a note, and some pictures, from Christian at Brilliant Creative, showing me how the crazy office furniture we worked on a while ago turned out. 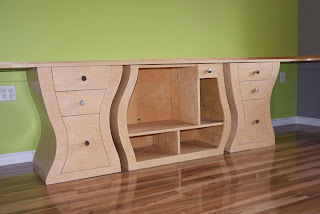 I really dig his choice of going natural maple! I think it looks stellar. On a last note, it looks like we are going ahead with the Chlamydia necklace for an upcoming shoot. We got the final go-ahead on today's job late yesterday. We got a call to make 4 wishbones for a shoot on Thursday, but they needed them by 5 pm today. Pretty tight deadline for sure! The saving grace was that we had made wishbones about 4 years ago, and still had the silicone mold for them. The original piece was made from a sculpted piece of 1/4" sintra and epoxy putty. They only asked for 4, but we gave them an extra just in case. Jody did all the flash trimming and painting, while I painted the lettering on the lawyer sign. They read quite a bit darker in the photos then they were in real life. I also put a hairline stress crack in each of them to insure they would all break the same way every time. I'm sure this will be a quick and dirty shot, but it's good to know that our stuff won't be giving them any issues. 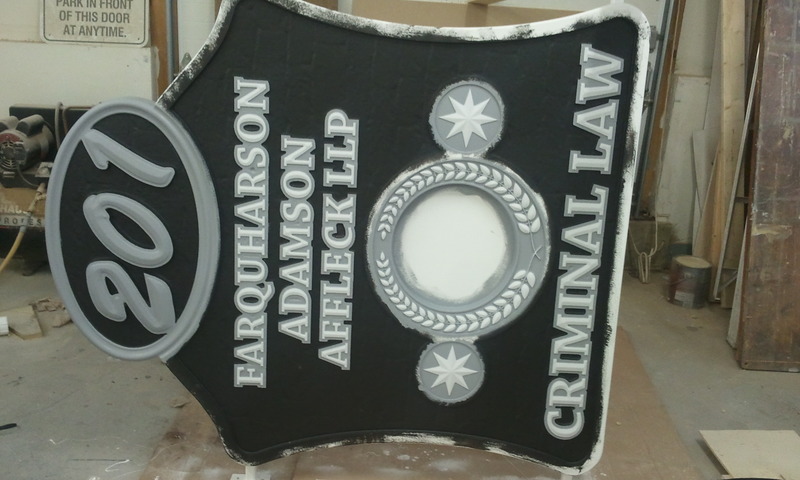 The Lawyer sign is moving along nicely, very monochromatic, but that's the what they wanted. I'm back at the new shop working on the framing and wall cladding tomorrow, as the move date is screaming towards us. Finally I get to see the money! 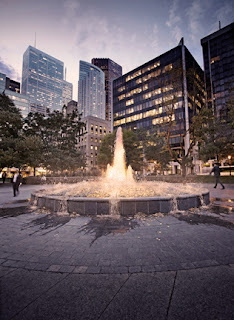 I think photographer Tyler Gray did a great job with this one! The Institue sign is DONE! The new shop space wasn't ready for us to start framing in the mezzanine for the new design studio yet. So my Dodge Caravan sits with more lumber in it than Lowe's. That's OK though. 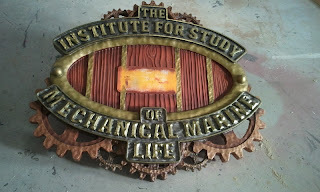 It gave me a chance to finish the Institute sign and get some painting done on the Lawyer sign as well. 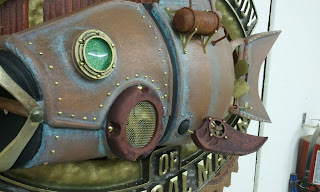 The Ballast tank got it's finishing paint touches, and the eye was the final piece. I decided not to light the eye, as this would have required running power to 1 LED, and I though it would just get drowned out as we will be positioning a spotlight on it in the studio anyway. 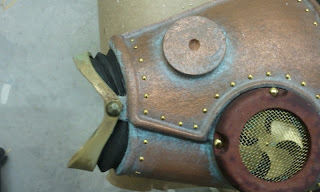 I did back-spray the eye lens with a dirty green, and put a piece of chrome mylar behind it to bounce the light back. From certain angles it works crazy good! 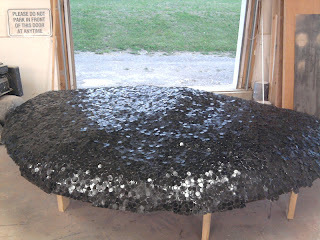 I look forward to seeing it hang in the new studio! Tomorrow we will be framing for sure....................I hope. 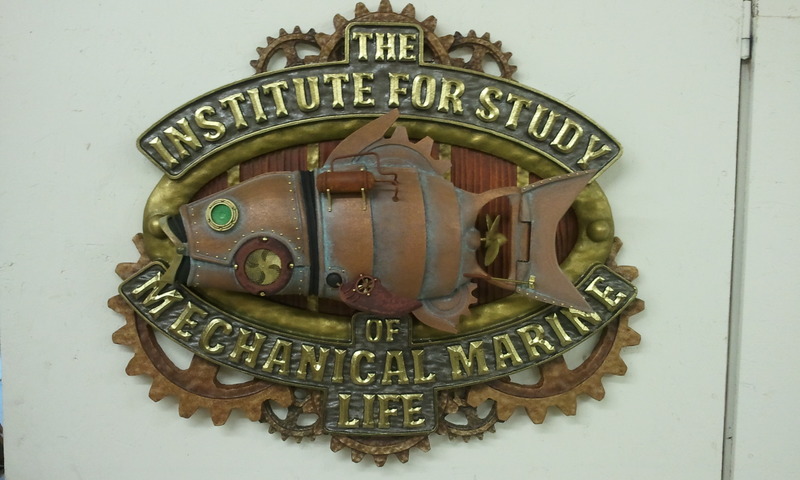 I spent today at the shop working on almost finishing up the mechanical fish for our Institute sign. 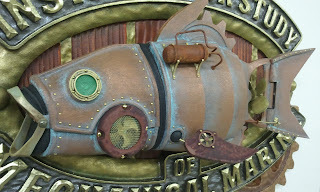 I started with the propeller at the back of the fish. After thinking about how to do it for a bit, I decided on cutting four separate blades and a square block of ren-shape for the hub. I cut four slots at 25 degrees on each side of the block that would let the blades slot in. 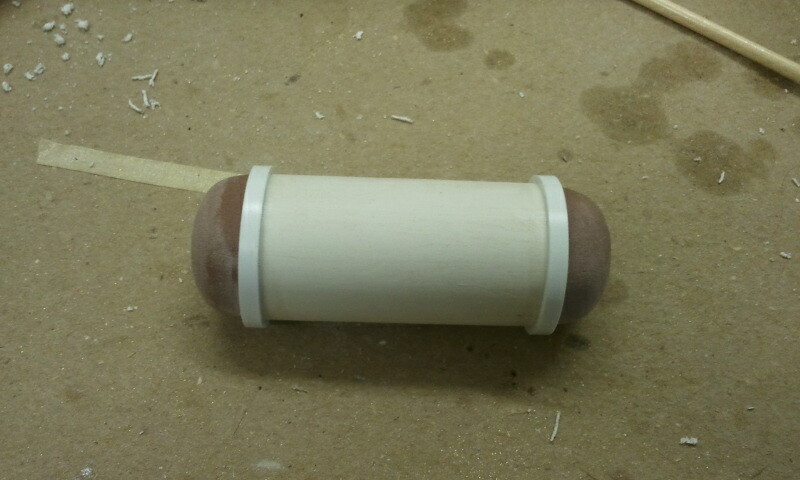 After a test fit, I spun the block on the disk sander to make it round, and ground a bullet shape tip on it. 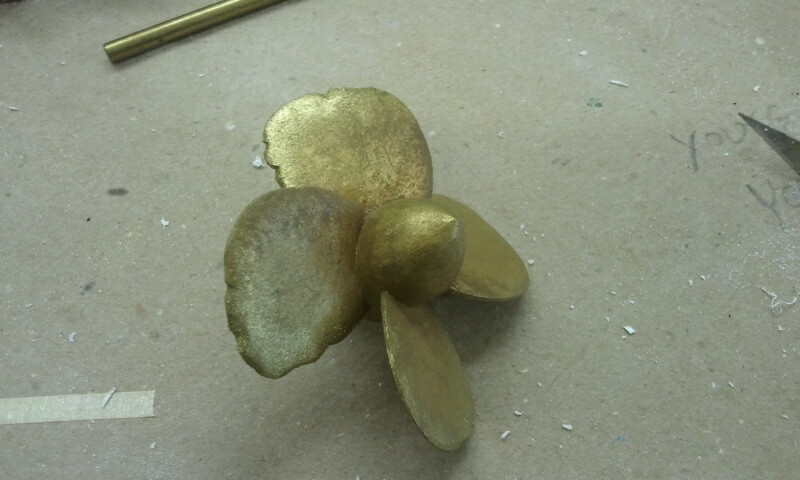 I also added some dings so it would look very well used, then made it look like cast brass. 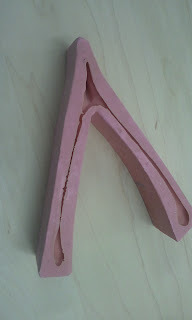 I cut the mouth out of 1/8" sintra and heat bent it around the mouth opening and added a furniture tack as a hinge pin. 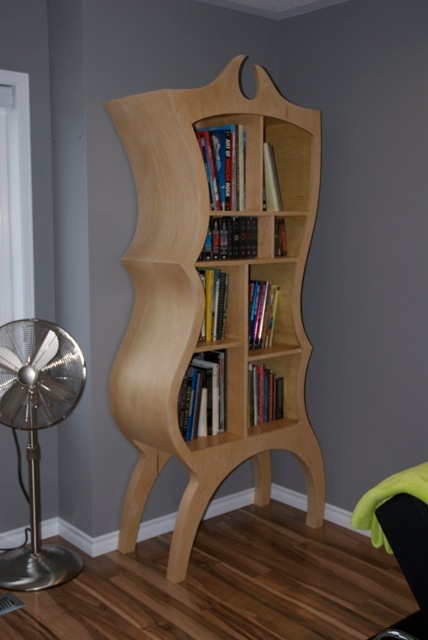 This would also go a brass colour. 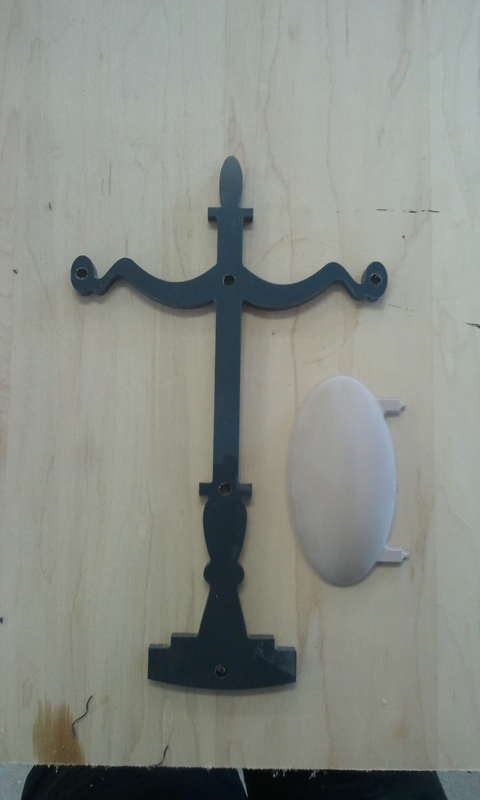 Right from the beginning I decided that I wanted a mechanical lever that would come out of the body and attach to the tail fin. Sort of a steering linkage of sorts. 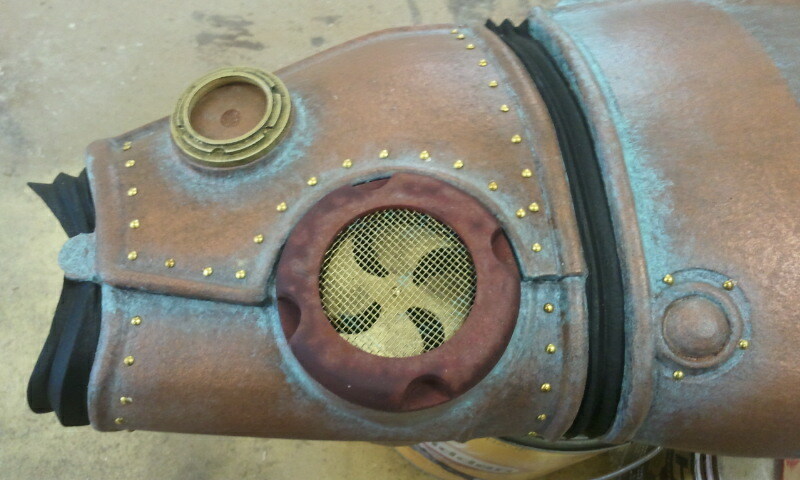 The final bit of detail would be a ballast tank that will mount on the side of the fish. 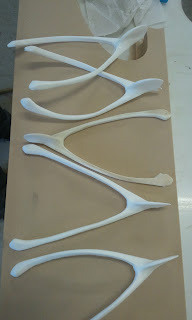 I used ren-shape again on each end of a piece of pvc pipe. I ground the ends to be domed shape and added styrene bands to cover the seam joints. 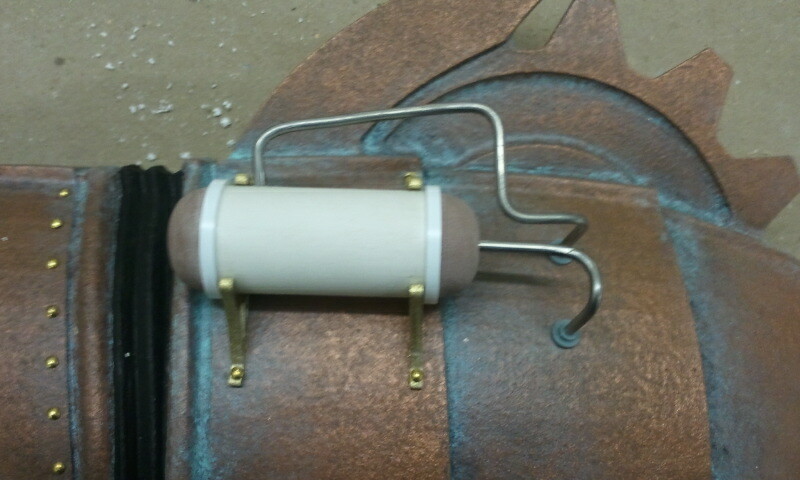 I bent up some tubing and added the flanges so it looked more functional. These would supply the tank with air for diving and surfacing. 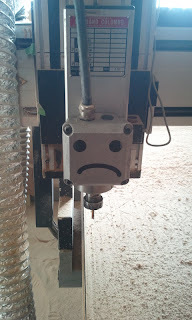 I used the I-carver to machine the mounting brackets out of 1/8" sintra again. 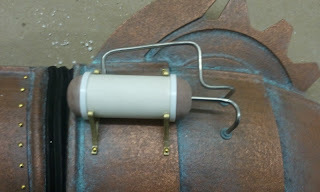 These brackets don't wrap around the whole tank, so I can "clip" it together after the final painting on the tank. 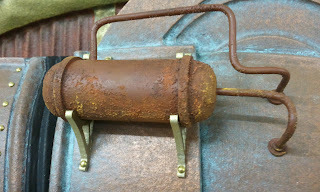 I painted the tank with rust coloured enamel and added some sand to it for some really nasty corrosion. I'll do the final paint dress when the paint is good and dry. 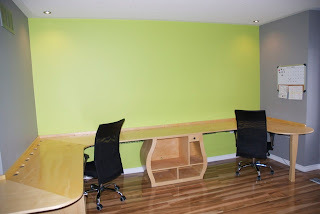 Tomorrow I'll be framing in the new office/design space at the new shop, so we can start to move equipment in. It's gonna be cool! Back in the COLD again! Mind you, this abandoned glass bottom boat was kinda cool though. I did get some free-diving video, but unfortunately my underwater camera gave up the ghost at 35 feet. Scuba is so much better, you don't have to come up for air. Well, I will be back at it today and tomorrow at the shop. We are starting to frame in the mezzanine at the new shop space this week, and that should be fun as well. 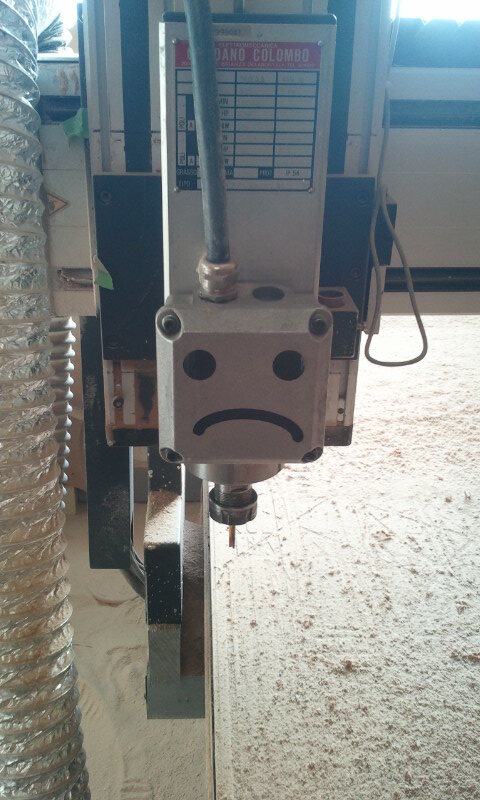 I got another 3d model to build before we leave on Friday, so there will be no more fabrication in the shop until I return. I did get lots done though. I started this morning with the weathering on the pectoral fin and bow thruster cap. 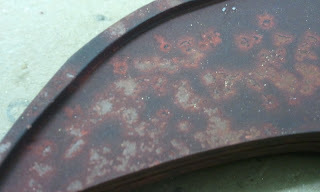 I had already painted them a rust colour yesterday. The above photo looks pretty strange, that's for sure. 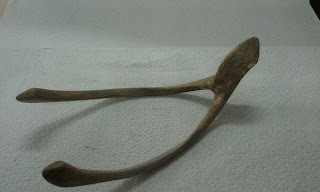 This is how I'm going to "chip" the paint. 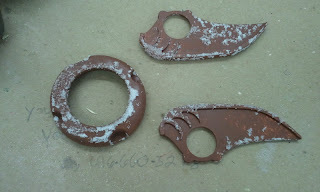 Basically I dampened down the areas of the model with a bit of water mixed with dish soap to break the surface tension. Dabbed it where I wanted the chipping and sprinkled table salt on it. The water makes the salt stick to the parts. The salt basically becomes the spray mask. Then I very gently air-brushed the colour on. 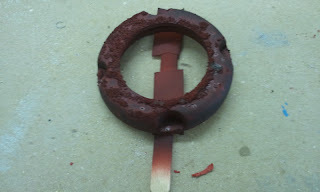 I started with a deep red colour, then air brushed a very watery black to tone the red down. This is what I ended up with after the top coat was done. After the paint had dried, I just brushed off the salt, exposing the underlying rust colour. 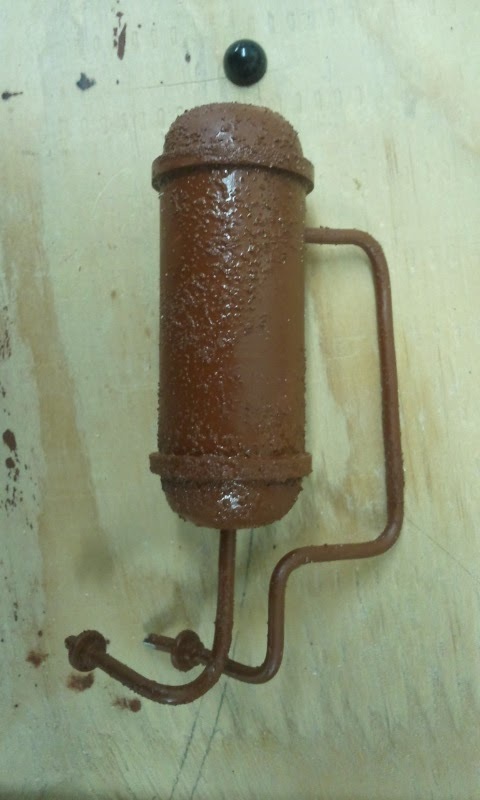 This technique can be used with multiple coats of different color paint, exposing the layers of time. Heres the pectoral fin assembled. I just need to touch up the seam, and it'll be done. 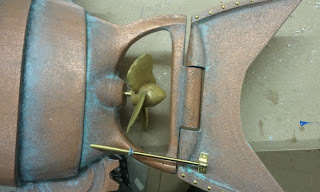 The bow thruster is almost done as well. The fan is mounted, and the screen has been glued in. Looks pretty cool I think! 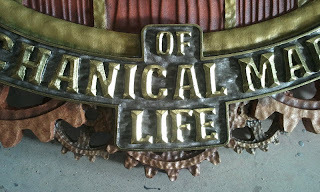 Finally, I finished the brass on the text. When I came in this morning, the gloss enamel black had dried past the point of being able to apply the powder. This means I had to re-coat everything again. Boy, gloss black on gloss black can be very hard to see where you've painted already! After a couple of hours it was ready for the powder. I just buffed it on and voila! Done. 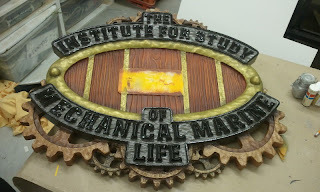 This part of the sign is now finished, with the exception of a few small touchups. Well, soon I will be diving in Cozumel. I love diving! But some of us aren't as excited to see me leave for a week. At least I'll be missed. Most of today was bogged down with the shark 3D model for the theme park dispenser. Send it off, wait for a response, continue on.........for most of the day. I did get the gloss black on the institute sign lettering. 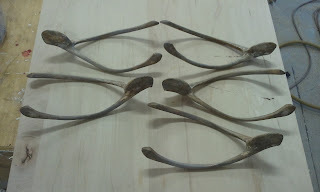 Tomorrow I should be able to get the brass powder on them in the morning. I also got the start of the paint on the fish portion. 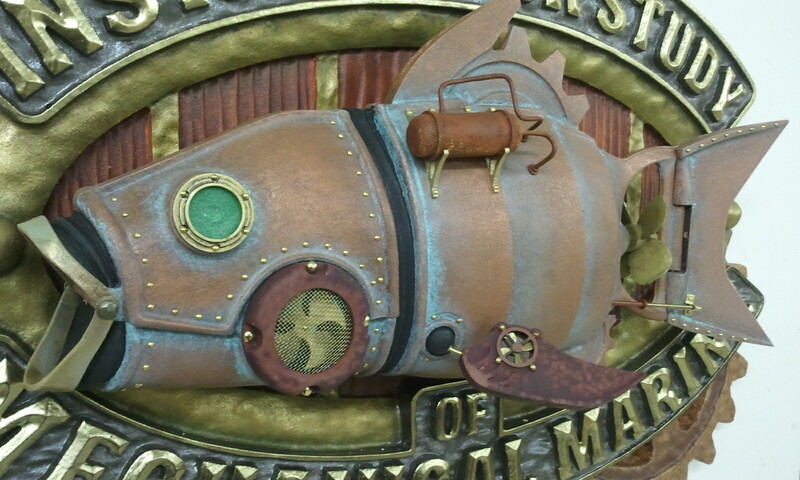 I decided for a copper fish. 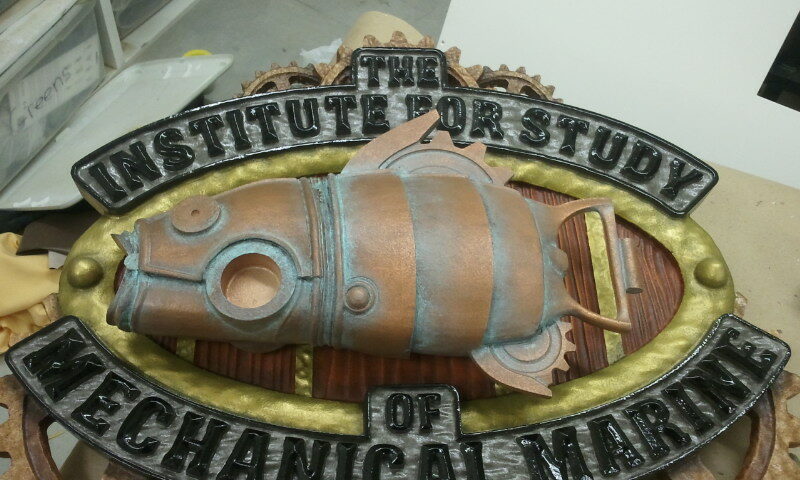 Largely because I really like copper, and it works well with the other colours on the sign. I painted the other bits, like the props and housings their colours as well. I decided that the bow thruster cover and pectoral fin would get a chipped paint finish, exposing rust underneath. This may or may not be the way to go, but I can always re-paint if it tanks! I am really hoping to get most of it done before I leave on Friday for Mexico. 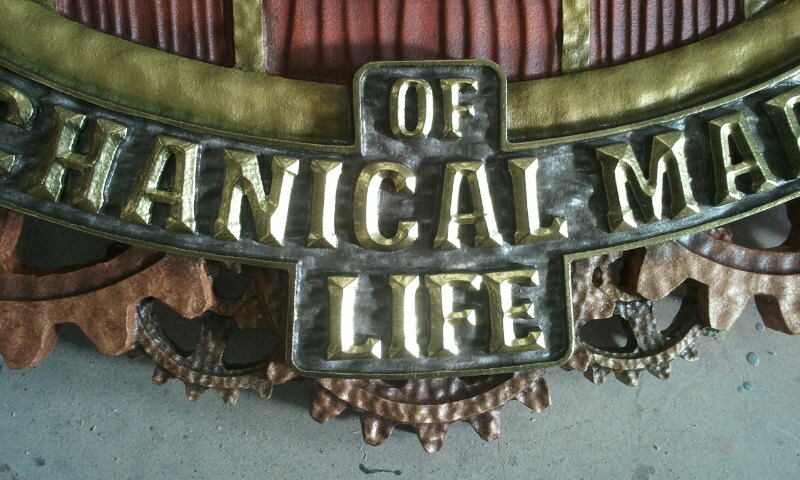 We have a prop we quoted on, as well as a stylized chair mold to machine as soon as we get back, so it's gonna be frantic with the move. 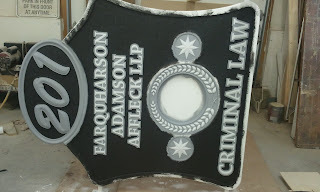 We will also have to finish the lawyer sign as well. I'll probably need another vacation! I was able to get into the shop on Saturday and get the final primer on the Lawyer sign done. Now I'm just waiting for the contractor who hired us to go over the colour scheme. The Institute sign is trucking along o.k. though. 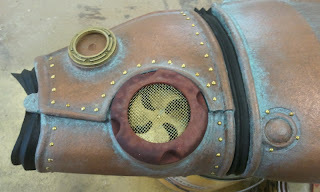 I cleaned up and did a final detail to the fish body and by 5 pm it was all primed. I also decided not to 3D machine the bow thruster cap. After spending more time contemplating how to do then it took to make, I decided to cut it from 4 layers of .125" sintra and stack them. 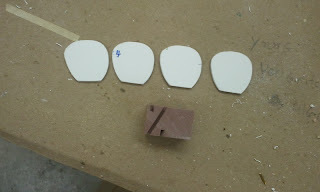 I also cut the 2 layers for the porthole eye frames. I cut the propeller for the bow thruster at the same time. I cut this from .0625" styrene and bent the blades so they weren't just sitting flat. The screen will go a dark brass-y colour. This will add a ton of visual interest to the head area, as "stuff" behind "stuff" always looks complicated!